Both in sound and improvisational approaches, the two offer fascinating contrasting and complementary sensibilities. Lovano’s cobalt-blue tone on tenor saxophone paired with Douglas’ crimson-tinged trumpet flares create startling timbres when they play in unison or intertwine improvisational lines. Its the latter on which they engage the most; their passages tend to gambol around each other like sparring partners. As one takes the lead, the other often jabs their counterpart – pushing the conversational friction beyond rote hard-bop. Douglas’ improvisations unleash like shards of broken glass that fall into place, like a melodically designed mosaic, whereas Lovano’s spurt like blossoming petals of a writhing vine. 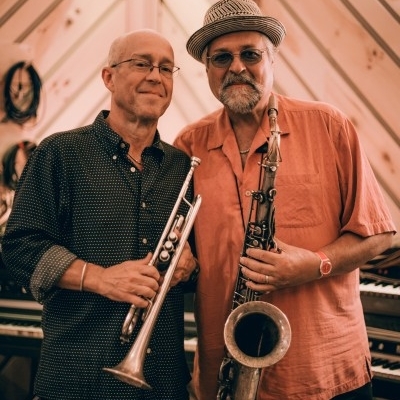 Drummer Joey Baron’s splintering rhythms and Linda May Han Oh’s colossal bass lines boost the leaders’ performances with plenty of rubato velocity and elastic cohesion, while pianist Lawrence Field’s calligraphy-like accompaniments provide the right amount of harmonic and melodic jolts.